The greater part of the railway 'network' of the island of Madagascar lay on the east side of the island and featured numerous sharp curves and a hundred tunnels in its 530 route miles. With gradients as severe as 1 in 28.5, a high point on the system of 5,530 feet and with much of the rail replaced with 60lb rail, the diesels used to replace the steam fleet would have to tread lightly. Because of this these diesel locomotives would be the first to use three bogies to carry the load, designated Bo-Bo-Bo, or shortened to 'tribo' in some texts. The first three diesels for Madagascar were contracted for in 1937. Completed at about the time World War II began the first three did not reach Madagascar until 1943. A second order of two locomotives, placed during 1939 were put into service during 1945/46. Five more of the same design were ordered after the war, being introduced in 1952. Two more were ordered and entered service in 1953. Alsthom would act as the main contractor and utilised the Sulzer 6LDA25 engine. Whilst normally rated at 735hp at 850rpm, altitude and temperature requirements saw the engines derated to 625hp. Cylinder diameter was 250mm. Wheel diameter was 35.5inches, bogie wheelbase 6ft 6in, distance between bogie pivots 12ft 4in, total wheelbase 31ft 2in, length over center buffers 40ft 3in. Top speed was 37mph, starting tractive effort was 26,500lb, the continuous effort was 17,600lb at 9.65mph. Empty weight for the first five locomotives was 58 tons, loaded 62 tons, the seven post-war units weighed 66 tons. These were used to haul 260 ton trailing loads from the coast at Brickaville or Anivorano to the capital Tananarive, maintaining a speed of 18mph on the uphill sections. Previous steam locomotives over this route were allowed 140 tons, managing 11mph on the grades. Passenger trains of 110 tons between Tamatave & Tananarive were allowed just under ten hours (uphill), and improvement of at least three hours over the steam schedules. Average speed of these triple bogie locomotives in service was 14.2mph. Fuel consumption was about 1.98kg per km, 45.4kg per hour & 12.15kg per 1,000tonne-km. The first diesels had a maximum axle loading of 10.5 tons, though later types were allowed 11 tons per axle. By 1959 the twelve Sulzers had covered a total of 5.6million miles (an average per locomotive of 35,000 miles per year.) Alsthom publicity material dated 1971 makes reference to this class and comments that the class were being withdrawn from service at this time. When the last order for seven locomotives was placed an extra power unit was delivered with the order. The French Colonial office diverted two of the 1948 order to Guinea, to operate on the Conakry - Niger line. These were the first diesels to operate over this route. How long these two machines operated in Guinea before heading to Madagascar is not recorded. In 1954 Alsthom delivered nine Bo-Bo locomotives, these however were fitted with quick running MGO engines. Five of the metre gauge Alsthom Sulzer Bo Bo Bo 625hp, 10.5 ton axle load locomotives at Tananarive, Madagascar. 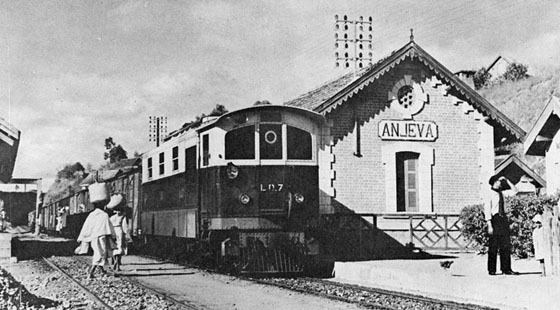 LD7 with a lengthy train at Anjeva station - presumably taken by a company photographer for one of the locomotive's equipment manufacturers. Based primarily on articles in Diesel Railway Traction, June 1953 & June 1959. Page added December 29th 2002. Last updated October 6th 2007.